But Of Corpse is pearly green with silver shimmer and black matte microglitter. Weird and wonderful! I'm not sure if I've ever seen anything else quite like But Of Corpse. I'm kinda speechless and smitten by the pure oddness. Perfection! The formula's hard to work with and gloppy, but the payoff....awesome! Without topcoat the result is satiny and slightly textured due to the glitter. With topcoat, the pearly quality comes out more. 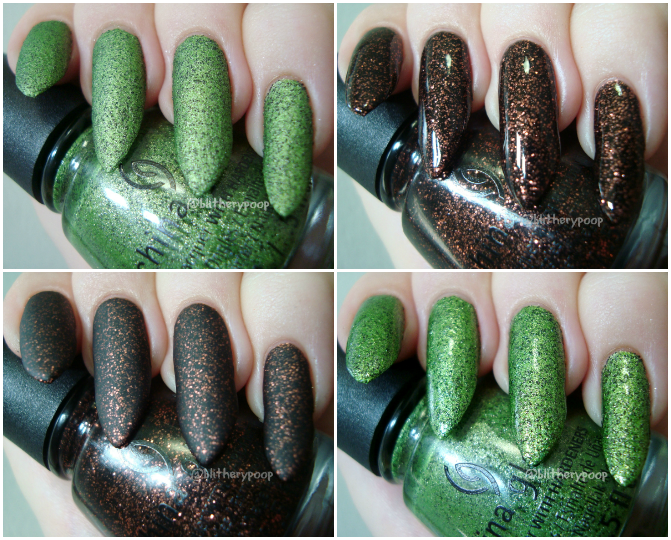 Getting To Gnaw You is a black jelly with tiny copper glitter. Microglitter is China Glaze's strong suit and this is another stunner! Getting To Gnaw You is sort of a Halloweeny twist on their classic Lubu Heels, but even more complex. There's some ultra-fine...shimmer?...nanoglitter? Teeny tiny sparkles! The base is on the sheer side, so I used three coats to boost depth and coverage. Matte top coat brings out the glitter, but loses the depth. Bottom line: Yes!! I'm doubly happy over these. They're not just the epitome of Halloween-ness, but they're also another hint that China Glaze is hopefully on the upswing. What are your favorite new Halloween polishes? But Of Corpse is definitely my top pick! But Of Corpse at me the name.